The aboriginal cultures of the Northwest Coast of North America are the best known ethnographic examples of complex hunter-gatherers and have been a major focus of anthropological attention since Franz Boas. Yet many aspects of traditional Northwest Coast societies and cultures remain controversial and even understudied. Slavery is one of the more important of these neglected topics: there is no systematic, detailed treatment of slavery in the culture area. When slavery is mentioned in more theoretical discussions of the region, it is treated as peripheral to the core of the Northwest Coast cultures. This book assembles, describes, and analyzes the range of available data, both historical and ethnographic, on slavery in traditional Northwest Coast cultures, increasing our understanding of what slavery was like in the area. This study is also motivated by the expectation that a fuller understanding of slavery will show just how slavery fit with and contributed to other aspects of traditional Northwest Coast culture and society. Detailed consideration is given to: Northwest Coast servitude as fulfilling an appropriate cross-cultural definition of slavery; the conditions and character of slave life; who owned slaves and the relations between masters and slaves; how slaves were produced (largely by capture in war), and transactions involving slaves (especially the trade in slaves); the nature, use, and value of slave labor (including an analysis of the organization of work on the Northwest Coast); and the role of slaves in rituals (there were a number of ritual occasions in which the killing of slaves was customary). Attention is also given to the probable antiquity of slavery in the region and to the changes that occurred in slavery in the century following European contact (1780 to 1880). For all of these topics both general patterns and intra-area variation are described and analyzed using a variety of methods including continuous area studies and ethnohistoric analysis. 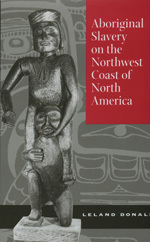 Northwest Coast slavery is put into context in two ways: by comparing the status of Northwest Coast slaves with that of war captives in other parts of traditional Native North America, where such captives are found not to have been made slaves; and by considering the place of slavery in the Northwest Coast cultures themselves. It is shown that, contra most of the existing literature, slaves were important to the Northwest Coast economies both because of their labor and as major items of value in a range of transactions. In addition, slavery not only supported, it made possible elaborate ranking and stratification systems and allowed the elite of each community to participate in intercommunity elite networks and to dominate both slaves and free persons in their home communities. Thus it is argued that the practice of slavery was central to other, more famous and frequently analyzed Northwest Coast cultural forms such as the potlatch and the spectacular art style and ritual systems that were a significant part of elite activity. With his investigation of slavery on the Northwest Coast of North America, Leland Donald makes a significant contribution to our understanding of the aboriginal cultures of this area. He shows that Northwest Coast servitude, relatively neglected by researchers in the past, fits an appropriate cross-cultural definition of slavery. Arguing that slaves and slavery were central to these hunting-fishing-gathering societies, he points out how important slaves were to the Northwest Coast economies for their labor and for their value as major items of exchange. Slavery also played a major role in more famous and frequently analyzed Northwest Coast cultural forms such as the potlatch and the spectacular art style and ritual systems of elite groups. The book includes detailed chapters on who owned slaves and the relations between masters and slaves; how slaves were procured; transactions in slaves; the nature, use, and value of slave labor; and the role of slaves in rituals. In addition to analyzing all the available data, ethnographic and historic, on slavery in traditional Northwest Coast cultures, Donald compares the status of Northwest Coast slaves with that of war captives in other parts of traditional Native North America. Leland Donald is Professor of Anthropology at the University of Victoria and editor of Themes in Ethnology and Culture History: Essays in Honour of David F. Aberle (1987).